Ray Dolby in his lab, from "Remembering Ray Dolby: A Life of Invention"
Those of us who came of age in the early 1970s are very familiar with the Dolby B noise reduction system since it was the key differentiator when buying stereo equipment in the day. The first commercial products containing the technology appeared in 1968. I am fairly certain that neither I nor any of my friends who insisted on tape decks with the Dolby logo on them had any idea how the circuit worked. At the time, to us filters were those fan-folded things on top of a carburetor and feedback was the annoying squeal that happened when a microphone got too close to a speaker. Knowledge of electronic circuits would begin a few years later. 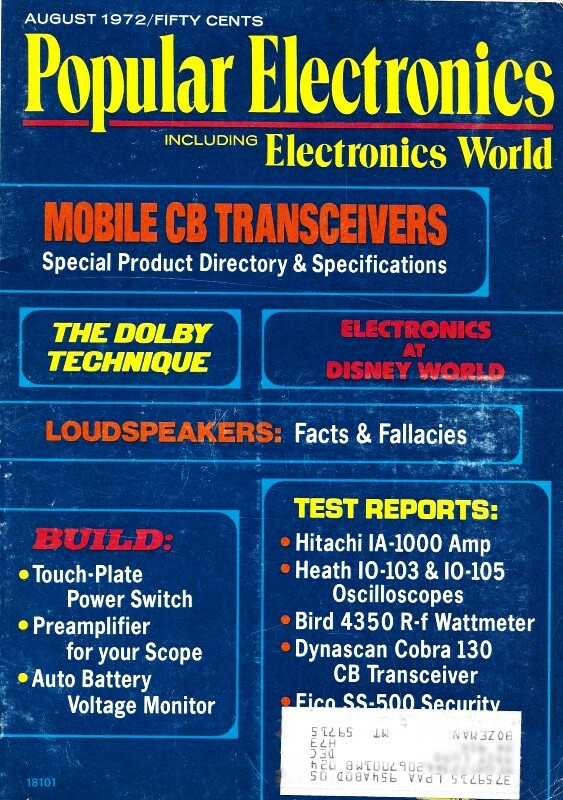 This article which appeared in a 1972 issue of Popular Electronics magazine does a nice job of introducing the theory (in layman's terms) behind Dolby noise reduction. There were no digital circuits, nor computers fast enough in 1968 to do the job, so everything was implemented in analog circuitry. Several Companies are Solving the Tape-Noise Problem with Special Circuits in Their Recorders. Here's How One of the Most Successful System Works. Noise can be defined as any undesired transmission which accompanies a desired signal. Should the amount of noise be minute when compared with the signal, it is unobtrusive and considered negligible. However, even when it is not at all comparable in magnitude to the intelligence to be reproduced, it will interfere with the program material. Hence, noise must be reduced to the smallest possible levels. Noise may be due to various factors. Radio and tape recordings occasionally suffer from noise generated by radiation or induction from electrical equipment. More important than this, the coating on the tape used for recording consists of tiny closely packed particles. Although they are almost identical in size and magnetic characteristics, there are variations in the number of particles at different places on the tape. These variations are of all frequencies, but are most obviously reproduced as high-frequency noise or "tape hiss." Theoretically uniform noise is known as "white noise." Interference of this type appears as a hiss and identical power is delivered at all frequencies. Tune your FM receiver between channels and the sound you hear, if your receiver does not have a quieting circuit and you can disable the de-emphasis circuit, is similar to white noise. Fig. 1. Input to Dolby network for a tape recorder goes through two paths, one being the special filter network. In addition to noise due to tape, the semiconductors in a tape recorder are the source of two types of noise. One, partition noise, is caused by the irregular division of the total transistor emitter current between the elements (base and collector) in the device. The second important source of noise in the transistor is shot noise. This is due to the discrete particle nature of electricity and the statistical variations in the motion of these electrical particles as they pass through the semiconductor device. Noise interference is a wide-band phenomenon. The ear responds to noise at all audible frequencies but the most annoying is high-frequency hiss, above about .5000 Hz. 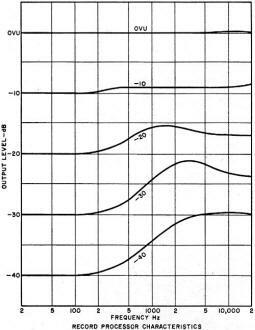 Elimination or reduction of noise present in the top octave of the audio range is a desirable goal and various circuits have been designed to accomplish this. Schemes To Minimize Noise. Before any method is applied to reduce noise, the amplifier must be designed so that it will be as noise-free as possible. Once circuit noise is minimized, the next step is to reduce noise originating from tapes or from any other medium used to reproduce program material. One of the most widely used methods to minimize the reproduction of high-frequency noise employs a low-pass passive filter. Low frequencies are passed freely to the output of the amplifier while the upper portion of the audio band is attenuated. A common arrangement consists of one resistor and one capacitor in a circuit designed to reduce high frequencies, letting them roll off at the eventual rate of 6 dB per octave. That is to say, every time the frequency doubles, the gain of the circuit is reduced by an additional 6 dB. If, for example, you wish to reduce noise by 10 dB at 5000 Hz, noise will be reduced by about another 6 dB at 10,000 Hz when the filter is used. Fig. 2. These are record process characteristics. Playback is the inverse. However, not only is the interfering noise reduced at these frequencies. The desirable music or program content is reduced as well and high-fidelity qualities are lost. In fact, some attenuation begins to become quite evident at the frequency where the gain is reduced by 3 dB, or at 1600 Hz in this case. The situation is improved by using two resistor-capacitor networks so that the eventual rolloff is at the rate of 12 dB per octave (twice the 6-dB-per-octave rolloff rate of one network). If the gain at 5000 Hz is reduced by 10 dB with such a circuit, the frequency at which the attenuation becomes evident (circuit gain reduced by 3 dB) is now about 2100 Hz. This is an improvement over the previous case, but the output from the amplifier is still badly limited in bandwidth. One method used to improve the signal-to-noise ratio when recording on tape is to "ride the gain." A maximum limit on the size of the signal that can be fed to the record preamplifier is set by the distortion or saturation characteristics of the tape. Weak signals which might be lost within the tape noise can be increased manually before being fed to the record amplifier. These signals can be boosted sufficiently before being recorded so that they can later override the noise during playback. Average and high-level signals can be manually limited in amplitude when fed to the recorder so that they will not saturate the tape. These signals are usually sufficient to mask any tape or record playback amplifier noise similar to them in frequency. A variation of this procedure uses an electronic compressor to limit the output as the gain increases. The relative output-level difference between the loud and soft passages of music is reduced. Extremely loud passages of music are subdued so as not to overload the tape or tape amplifiers, while relatively low intensities of sound are recorded at comparatively higher levels. The opposite of the compressor - the expander - is placed at the output of the tape recorder to restore normal amplitude relationships. One big drawback to this system is the time it takes for the compressor and expander to go into action. Another defect is "breathing" or noise modulation. Background noise is alternately increased and decreased, producing very annoying listening conditions. Another very successful means of improving the signal-to-noise ratio uses pre-emphasis and de-emphasis in the recording and playback processes, respectively. Standard curves specify that the high frequencies be emphasized a fixed amount while recording on tape. These same frequencies are reduced by an equal amount during the playback process so that the overall frequency response is level. Noise is overridden by the large high-frequency signals placed on the tape in the record process and is reduced during playback due to attenuation of the high end of the band. This system is used on all tapes and playback equipment that is currently available on the market. The Dolby System. Perfecting the procedure just described, and adding some additional brilliant features, Dr. Ray Dolby evolved an excellent method of reducing noise and hiss, along with any other type of undesirable low-level material found on tapes. First, let us state the one thing this method of noise reduction cannot do. It cannot eliminate noise already recorded on the tape. Similar to the compressor / expander and pre-emphasis / de-emphasis methods, the program material must be processed before it enters the recorder electronics and after it emerges. Here is how the Dolby B-type system used in home recording equipment works. However annoying, noise on tape is usually at a much lower level than the music or other program material. On loud passages, noise is masked by the program material. You do not hear the noise which may be 40 or 50 dB below the level of the de­sired sound. During quiet passages, however, the level of noise is comparable to the level of the music. It is quite objectionable. The Dolby noise-reduction system discriminates between loud and soft passages and attenuates noise only when it can be annoying, as is the case when low levels of material are being reproduced. Fig. 3. Dolby output network from recorder has one path through feedback. Tape hiss, being a high-frequency phenomenon, is poorly masked by the low frequencies in the program material, even when the amplitude of the signal is high. Therefore, the Dolby system separates the high-frequency band from the low frequencies. Large signals at low frequencies will not keep the high-frequency noise from being attenuated. Only high-frequency amplitudes determine when noise will or will not be reduced. Should fixed-filter circuits be used to determine or separate the high-frequency band from the low frequencies, breathing can become evident. Instead of a fixed filter, a variable type is used. The frequency characteristic automatically adjusts itself, by use of a feedback circuit, for the best performance. Briefly, the input to the tape recorder takes the form shown in Fig. 1. The input signal follows two paths in the Dolby circuit before being fed to a summing or adder network. One path is directly to the adder. The second path is through a network which separates the high-frequency but low-level input signals from the rest of the material to be recorded. The output of the network is significant above 1 kHz, rising to its maximum level at 5 kHz and above. The selected signals are amplified and fed to the adder. The sum of the direct signal and the amplified low-level, high-frequency signals, is then fed to the input of the tape recorder. It should now be obvious that any signal 1% or less over 5000 Hz will be increased 10 dB while those signals over 1% will be allowed to pass through without any Dolby action. The direct opposite will be true on playback. Any signal that is of 10 dB level or below will again actuate the level-selective network and, in this case, attenuate all high frequencies to their previous normal level. The simple description above implies that the circuit has a sharp threshold at the 1% level. In practice, as the high-frequency signals rise above the 1% level, so the amount of boost introduced falls progressively from the 2.16 times. At levels of -20 dB and above, the boost is negligible, avoiding any over-modulation produced by higher peak signal levels than normally used. The output from the preamplifier stages of the tape recorder feeds a network with frequency characteristics similar to the one at the input (Fig. 3). However, this time the path is through a subtractor. All the factors added to the signal by the network in Fig. 1 are now reduced by an equal amount. 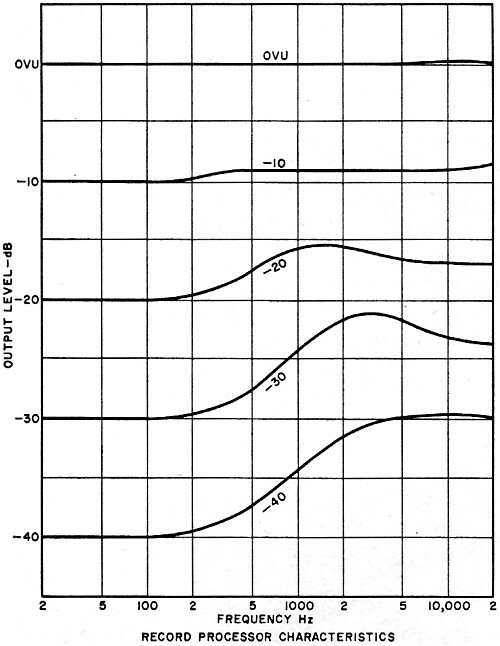 The original program material is restored in proper amplitude proportion, expanding the difference between the high- and low-amplitude portions of the signal. However, noise introduced by the tape and electronics is reduced by about 10 dB over what it would have been without the intervening Dolby circuits. The amplified high-frequency signals introduced at the input of the recorder are capable of overriding much of the noise normally generated while recording. Reducing gain of these frequencies at the output also diminishes the audible noise. Although the system is complex, it can be made as a relatively simple and inexpensive circuit. The 10-dB reduction in hiss and noise makes it quite worthwhile. When playing back a Dolbyized tape through conventional equipment, it is only necessary to reduce the treble response somewhat, using the tone control.